I wonder if there isn’t a strange curse at work upon the reviews I intend to write for Aliette de Bodard’s fiction. Ever since I read “Servant of the Underworld”, the first novel in her “Obsidian and Blood” trilogy, I found myself attracted to Aliette de Bodard’s imagination, style and works. And that attraction grew with the other two novels of the “Obsidian and Blood” trilogy, “Harbinger of the Storm” and “Master of the House of Darts”, and especially with her short fiction which has been nothing but top notch. If with her novels I can set the guilt aside and excuse the postponement of the reviews with the early days of parenthood, but with “Scattered Among Strange Worlds” and “On a Red Station, Drifting” is not that easy. Even more difficult in the particular case of “On a Red Station, Drifting”, an amazing novella I had the chance to read at the beginning of this year and yet, for which I keep failing miserably to finish the review. I really need to find a solution for finally give Aliette de Bodard’s works the attention they truly deserve. 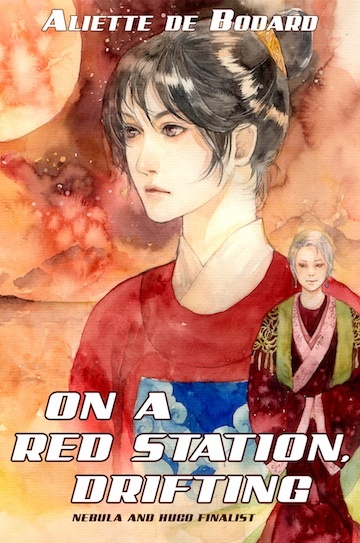 No matter the outcome of my dilemma, you still have the chance to enjoy Aliette de Bodard’s “On a Red Station, Drifting” on ebook format at a very attractive price, 2,99$ on Amazon US or 1,97£ on Amazon UK. And with a far better cover artwork than the physical edition of her novella. Trust me, it is worth every single penny. Or if you need more assurance, trust all the judges of prestigious awards who rightfully nominated or awarded Aliette de Bodard’s work recently.